Isn't this the cutest little girl in the cutest little cardigan? 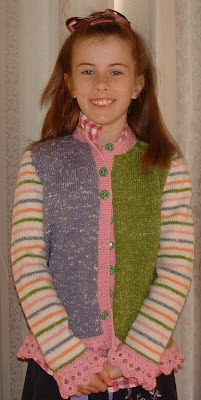 This is my husband's cousin, Sarah wearing a cardigan i knitted/crocheted for her birthday. I just love how fun and cute it is - so colourful and playful. And the crocheted edging really gives it a bit of a lift and makes it so pretty in the pink!! I've been busy with some scrapping and cardmaking lately, but i havn't gotten around to photographing any of it - it's too dark when i come home at night lately to get good photos!! I'll have to take some on the weekend. I just got back from the monthly Stampin' Up meeting we have for our group, and it was so fun to see everyone again - and meet a lot of new faces!! It seems that there have been quite a few people joining in the last couple of months - it's becoming quite popular down here!! It was very exciting to participate in some swaps with some of the girls there, and i recieved some lovely cards, that i can't wait to show you - i'll photograph them on the weekend too!! I'm looking forward to a lovely break away next week - we're going down to a lovely little place called Brogo - about 25 minutes from Bega. It's a little cottage in the middle of nowhere with a fireplace and a backyard for the puppies - a chance for us to relax and spend some time together - and i think i might just take some scrapping stuff down with me too!! Before we head off though, we're having a '4D' ultrasound on Saturday, where we'll get to see some amazing images of baby - right down to facial features!! I am so excited about this - more photos i'll have to post! !